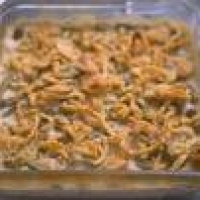 Green Bean Casserole with a twist. When people first try it, they can't believe that they like it. 9Normally they don't.0 Even my husband who doesn't like green beans likes it! 1 1/2 cans of Beans, then 1 can of soup. The other 1 1/2 cans of Beans and 2nd can of Soup. Bake in oven at 350 for 30 minutes. until the onions are toasted brown. Like choco780's recipes? Never miss an upload!